Hereford suffered their worst home loss since returning to the Football League. Gillingham stunned the Bulls with two in five minutes, Frank Nouble firing home before Garry Richards' close-range header. Two more came either side of half-time through Joe Heath's own goal and Danny Jackman's 25-yard strike. Rob Purdie missed a penalty for the Bulls before Chris Whelpdale and Stefan Payne made it six, Sam Winnall pulling back a late Hereford consolation. It was the Bulls' worst battering since losing 6-1 at Bristol Rovers in August 2008, their second season back in the Football League after a 10-year absence - but their last five-goal home defeat was by Chester back in November 1993. "One thing I am not is a quitter - I won't quit but if that is what they (the directors) decide then that is up to them. "If they think that is the best for the football club than that is fine, I will accept that decision. "But I am not going to give in - you should know that as I wasn't a quitter as a player and I am not as a person, so it is up to them to decide that as it is out of my hands." "Being a manager and knowing Jamie (Pitman) as I do, he's a hard worker and it's a tough day for them. "On my own team's performance, I thought we were terrific today. We took our goals well. "We needed a win and we got it. It's great that we scored the goals and the performance was good. "It was a workman-like performance. We were strong and we took our chances." 92:11 The referee ends the match. 90:00+1:55 Tom Barkhuizen produces a cross, clearance made by Chris Whelpdale. 90:00+0:53 Chris Whelpdale takes a shot. Harry Pell gets a block in. 89:39 The referee blows for offside. Ross Flitney takes the indirect free kick. 89:14 The ball is sent over by Charlie Lee, Robert Purdie gets a block in. 87:40 Free kick awarded for a foul by Sam Winnall on Garry Richards. Ross Flitney takes the direct free kick. 86:44 GOAL - Sam Winnall:Hereford 1 - 6 Gillingham Sam Winnall hits the back of the net with a goal direct from the free kick from long range to the top right corner of the goal. Hereford 1-6 Gillingham. 86:01 Andy Frampton gives away a free kick for an unfair challenge on Sam Winnall. 85:33 The referee blows for offside. Indirect free kick taken by David Cornell. 84:32 Harry Pell challenges Luke Rooney unfairly and gives away a free kick. Joe Martin takes the free kick. 82:22 Assist on the goal came from Dennis Oli. 82:22 GOAL - Stefan Payne:Hereford 0 - 6 Gillingham Stefan Payne fires in a goal from just outside the area to the bottom right corner of the goal. Hereford 0-6 Gillingham. 81:14 Simon Clist challenges Barry Fuller unfairly and gives away a free kick. Luke Rooney takes the free kick. 79:10 Substitution Dennis Oli is brought on as a substitute for Danny Kedwell. 78:23 GOAL - Chris Whelpdale:Hereford 0 - 5 Gillingham Chris Whelpdale scores. Hereford 0-5 Gillingham. 77:25 Corner from the right by-line taken by Simon Clist, comfortable save by Ross Flitney. 76:31 Harry Pell fouled by Lewis Montrose, the ref awards a free kick. Harry Pell produces a strike on goal direct from the free kick, Barry Fuller gets a block in. 75:26 The ball is delivered by Joe Martin, David Cornell manages to make a clearance. 74:49 Danny Kedwell takes a shot. Ryan Green gets a block in. 73:54 Substitution Stefan Payne replaces Frank Nouble. 73:12 Outswinging corner taken by Luke Rooney from the right by-line, clearance made by Delroy Facey. 72:41 Luke Rooney takes a outswinging corner to the near post, clearance by Delroy Facey. 72:23 Charlie Lee takes a shot. Save by David Cornell. 70:54 Substitution Lewis Montrose is brought on as a substitute for Danny Jackman. 70:35 Luke Rooney takes a shot. Blocked by Will Evans. 69:58 Corner taken left-footed by Danny Jackman from the right by-line, David Cornell makes a comfortable save. 69:40 Luke Rooney takes a shot. Blocked by Robert Purdie. 67:53 Inswinging corner taken left-footed by Danny Jackman from the right by-line, Danny Kedwell has a headed effort at goal from deep inside the area missing to the left of the target. 67:46 Centre by Chris Whelpdale, Will Evans gets a block in. 64:19 Corner from the right by-line taken by Nicky Featherstone, Garry Richards makes a clearance. 63:56 Sam Winnall takes a shot. Save by Ross Flitney. 63:42 Free kick awarded for an unfair challenge on Ryan Green by Charlie Lee. Ryan Green restarts play with the free kick. 62:00 Booking Charlie Lee is booked. 61:31 Penalty missed by Robert Purdie. 61:31 Corner taken right-footed by Simon Clist, Andy Frampton gives away a Penalty for an unfair challenge on Harry Pell. 60:32 Shot comes in from Sam Winnall from the free kick, blocked by Barry Fuller. 60:32 Booking The referee books Andy Frampton for unsporting behaviour. 60:25 Unfair challenge on Joe Heath by Charlie Lee results in a free kick. 59:04 Simon Clist crosses the ball, Header from deep inside the penalty area by Sam Winnall goes harmlessly over the crossbar. 57:39 A cross is delivered by Chris Whelpdale, Joe Heath makes a clearance. 55:17 Unfair challenge on Ryan Green by Danny Kedwell results in a free kick. David Cornell restarts play with the free kick. 54:45 Tom Barkhuizen challenges Joe Martin unfairly and gives away a free kick. Free kick taken by Andy Frampton. 53:32 Barry Fuller has a shot on goal from outside the box which misses right. 51:22 Free kick awarded for a foul by Sam Winnall on Danny Jackman. Andy Frampton restarts play with the free kick. 50:07 Substitution Delroy Facey on for Yoann Arquin. 48:01 Assist by Luke Rooney. 48:01 GOAL - Danny Jackman:Hereford 0 - 4 Gillingham Danny Jackman scores a goal from the edge of the area to the top right corner of the goal. 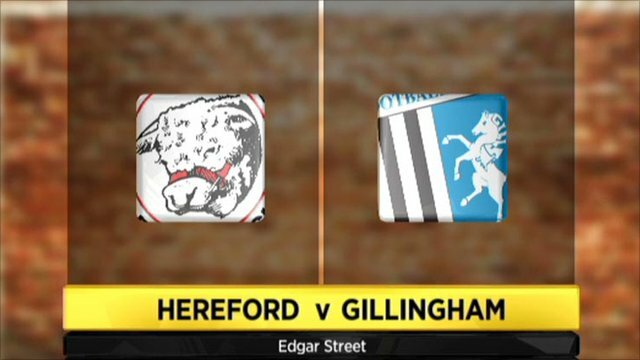 Hereford 0-4 Gillingham. 46:56 Inswinging corner taken from the left by-line by Luke Rooney, Danny Kedwell takes a shot. David Cornell makes a save. 46:48 The ball is sent over by Luke Rooney, Ryan Green gets a block in. 45:00+2:12 It is the end of the first-half. 44:29 Frank Nouble takes a shot. Ryan Green gets a block in. 43:23 The ball is sent over by Sam Winnall, clearance made by Andy Frampton. 41:29 The assistant referee signals for offside against Robert Purdie. Andy Frampton takes the indirect free kick. 39:53 GOAL - Joe Heath:Hereford 0 - 3 Gillingham An own goal is scored by Joe Heath. Hereford 0-3 Gillingham. 35:05 Free kick awarded for an unfair challenge on Tom Barkhuizen by Joe Martin. Direct free kick taken by Robert Purdie. 34:26 Sam Winnall sends in a cross. Correction - 33:41 Centre by Robert Purdie, clearance made by Ross Flitney. Harry Pell has an effort at goal from the edge of the area that misses to the right of the target. 33:41 The ball is swung over by Robert Purdie, Ross Flitney manages to make a clearance. Effort from outside the penalty box by Harry Pell goes wide right of the goal. 32:59 The ball is swung over by Danny Jackman, clearance by Harry Pell. 32:26 Luke Rooney takes the free kick. 32:26 Booking Robert Purdie is shown a yellow card. 32:12 Unfair challenge on Luke Rooney by Robert Purdie results in a free kick. 29:13 Frank Nouble delivers the ball, Joe Heath gets a block in. 27:20 Corner taken right-footed by Nicky Featherstone from the right by-line, Ryan Green challenges Andy Frampton unfairly and gives away a free kick. Direct free kick taken by Ross Flitney. 27:15 Centre by Joe Heath, clearance by Andy Frampton. 26:32 The ball is delivered by Yoann Arquin. 24:44 Harry Pell gives away a free kick for an unfair challenge on Joe Martin. Joe Martin takes the direct free kick. 24:17 Danny Kedwell concedes a free kick for a foul on Will Evans. David Cornell restarts play with the free kick. 23:28 Danny Jackman provided the assist for the goal. 23:28 GOAL - Garry Richards:Hereford 0 - 2 Gillingham Garry Richards scores a headed goal from close range. Hereford 0-2 Gillingham. 22:07 Yoann Arquin is flagged offside by the assistant referee. Ross Flitney restarts play with the free kick. 21:16 Effort from outside the penalty box by Danny Kedwell goes wide right of the goal. 19:01 The assistant referee signals for offside against Yoann Arquin. Ross Flitney takes the indirect free kick. 18:05 GOAL - Frank Nouble:Hereford 0 - 1 Gillingham Frank Nouble finds the back of the net with a goal from the edge of the penalty box low into the middle of the goal. Hereford 0-1 Gillingham. 17:08 The assistant referee flags for offside against Yoann Arquin. Joe Martin takes the free kick. 16:35 Frank Nouble produces a cross. 15:22 Yoann Arquin challenges Garry Richards unfairly and gives away a free kick. Free kick taken by Barry Fuller. 13:36 The ball is delivered by Joe Martin, save made by David Cornell. 11:45 Simon Clist delivers the ball, clearance made by Joe Martin. 11:06 Direct free kick taken by Tom Barkhuizen. 11:06 Booking The referee cautions Barry Fuller for unsporting behaviour. 11:00 Free kick awarded for an unfair challenge on Yoann Arquin by Barry Fuller. 8:59 The referee gives a free kick against Tom Barkhuizen for handball. Free kick taken by Ross Flitney. 8:11 Tom Barkhuizen sends in a cross, Garry Richards manages to make a clearance. 7:20 Sam Winnall takes a shot. Chris Whelpdale gets a block in. 5:22 Barry Fuller crosses the ball, David Cornell makes a comfortable save. 4:16 Shot from outside the area by Luke Rooney misses to the left of the target. 2:58 Tom Barkhuizen challenges Joe Martin unfairly and gives away a free kick. Direct free kick taken by Andy Frampton. 2:48 The ball is delivered by Garry Richards, Ryan Green manages to make a clearance. 1:55 Chris Whelpdale takes a shot. Joe Heath gets a block in. 1:36 The ball is sent over by Tom Barkhuizen, Barry Fuller manages to make a clearance. 0:55 Centre by Joe Heath, Sam Winnall takes a shot. Save by Ross Flitney. 0:37 The ball is crossed by Tom Barkhuizen, Chris Whelpdale manages to make a clearance. 0:21 The offside flag is raised against Frank Nouble. David Cornell takes the indirect free kick.